The Year I Didn’t Go to School: A Homemade Circus is adapted from the autobiographical children’s book by Giselle Potter. Young Giselle receives a journal from her grandparents just before she embarks on a yearlong adventure with her family to travel Italy as part of a family theater group called the Mystic Paper Beasts. As such, it is a highly-romanticized depiction of the best moments along the way and it is a charming play for children that turns out to be a third adventure, a third history, culture and language lesson on Italy, and a third instructive fairy tale. You know, the kind that has a moral to it. In this case, the moral is a heartening one about conquering one’s fears and staying positive under duress. Supported by loving and artistic parents, and even more loving and artistic grandparents, Giselle and her sister are able to meet the challenges of a new setting, a new language, new food and the uncertainties of a street performing life. While her little sister is able to forge ahead quite fearlessly, addressing strangers, approaching stray animals and performing her act with pizazz, Giselle suffers from a more timid approach to life. She is prone to overthinking and worry, and her journal (AKA the audience) as much as her parents and the echoing advice of her grandfather (who she refers to only as Fuller) help her to adapt to the challenges along the way. 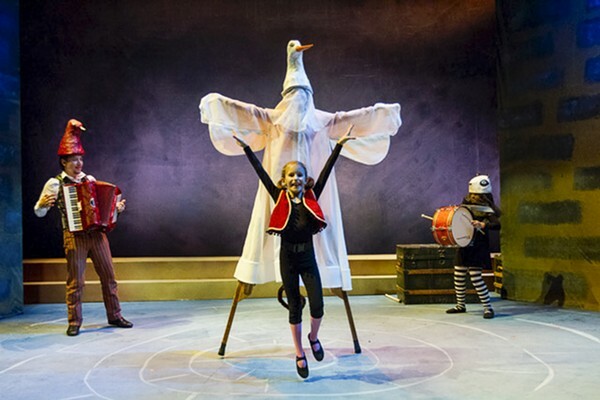 What the children in the audience receive as a result, is a chance to chime in with some Italian lingo, and a chance to live vicariously through the adventures of Giselle and sister as they perform, try out circus arts, and help their parents through a few tight squeezes. The set (by Daniel Ostling, Cassandra Bowers) and costumes (by Mara Blumfeld) are stylized to match the book, with the clever use of puppets to depict the convivial street scenes in Italy. At one point, the family performs in a circus festival and gets to meet and befriend some circus performers who inspire the girls to try lyra and hooping. There were some familiar faces and behind-the-scenes people from the Chicago circus and puppet world in the production. Sylvia Hernandez-DisStasi from the Actors Gymnasium choreographed the dance and circus sequences with her signature whimsical style. Julie Greenberg of Midnight Circus and her young daughter Samantha Jenkins play Giselle and Grandma. Samantha shared the role of Giselle with actor Emily Zimmerman—the actor whom we had the pleasure of seeing that evening. The sister Chloe role is also shared between two talented young actors, Ava Tommasone and Audrey Edwards. The father, Matthew Yee, played a multi-talented musical kind of dad that any young girl would be happy to sing along with and Lindsey Noel Whiting plays a doting, supportive mom. She recently starred in Mr. & Mrs. Pennyworth with Lookingglass. Adrian Danzig (aka Fuller the grandpa) is a veteran of 500 Clown and well known as a teacher and performer in the physical theater world, and Aerial Emery, who plays a hooping and lyra spinning circus artist, is a Midnight Circus alumni. The Year I Didn’t Go to School: A Homemade Circus is a feel-good experience for a young family, and one that could easily be used a springboard to address interesting topics like travel, methods of education, self-awareness, the role of supporting family, how to overcome fears, and the benefits of resilience. Plus, it is all wrapped up in a pretty circus and theater themed package to make it enticing. Needless to say, the young audience was very enthusiastic on the night we attended. The Year I Didn’t Go to School: A Homemade Circus runs through March 19 at the Ruth Page Center, 1016 N. Dearborn St. Shows are Tuesday-Sunday. Tickets are $10-$39.